Conceived in 2011 and facilitated through a Faculty Professional Development Center Learning Community Grand award, the Interdisciplinary Center for Environmental Sciences (ICES) development began in cooperation with the Student Association, Inc. at California University of Pennsylvania. A planning workshop in June 2012 brought together a diverse group of faculty, staff, students and regional members of the community. A number of topics were discussed including the mission, vision and activities that could be possible. ICES was formally established as a self-supported organization with the Student Association, Inc. in Fall 2015. ICES seeks to establish an environmental center at California University of Pennsylvania to create inter-institutional partnerships that may serve to build, facilitate, coordinate and enhance existing and future environmental programs. ICES will operate under an Advisory Board that represents diverse backgrounds and interests, broad community representation inclusive of Cal U (across all colleges, offices, and administration), and the SWPA region. The SAI Farm Master Plan set aside an approx. 10 acre parcel known as the Environmental Studies Habitat. This area of the property provides a diverse environment including wooded area, wetlands, a stream and open field space. The 3,000 sqft barn has also been designated as a potential multi-use educational and research facility. 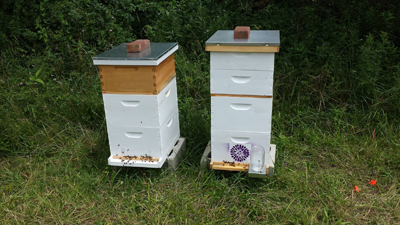 During summer 2015, two hives of Pollinator and Honey Bees have been established at the SAI Farm. 84% of the crops grown for human consumption need bees and other insects to pollinate them. Bees make an invaluable contribution to ecosystems. By pollinating various plants for human, bird and small mammal consumption, they are essentially guardians of the food chain and the biodiversity of our species. 3) Students will be able to take courses (Entomology, Ecology, Plant Biology and many others) where their learning can be extended outside the class room to the SAI Farm learning about the biology of these and other insects. 4) Beekeeping and hive management techniques can be offered through appropriate courses The establishment of the hive is also crucial due to the recent worldwide trend of Colony Collapse Disorder (CCD). This is a phenomenon that occurs when the majority of worker bees in a colony disappear and leave behind a queen, plenty of food, and a few nurse bees to care for the remaining immature bees and the queen. This is particularly drastic and rising in number of disappearances with colonies in North America. 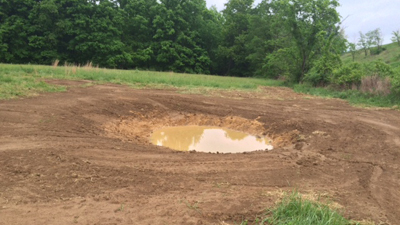 During summer 2015, in partnership between ICES and Cal U's Partners for Fish and Wildlife students helped develop a small wetland on the Natural Environmental Habitat. The wetland provides opportunities for students to extend their curriculum outside of the classroom to the Farm. There are opportunities for research and community education efforts. The USEPA states wetlands are part of the foundation of our nation's water resources. 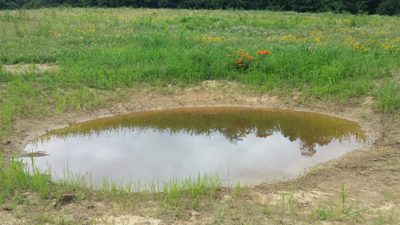 Wetlands provide critical habitat for fish and wildlife, improve water quality and reduce flooding. There are also economic benefits as they vital to community recreational activities. This wetland will be enlarged in future years providing further hands on learning opportunities and academic benefits to future students while increasing habitat diversity and expanding usage. During the Fall 2015 semester, ICES and SAI partnered with a local Eagle Scout troop to design and implement a nature trail, boardwalk accessing an overlook of a natural wetland on the Environmental Studies Habitat at the SAI Farm. This trail will allow access through the wooded area for university students and visiting members of the community including high school students. This will allow greater opportunity for access to enjoy nature while providing opportunities to learn about it. In time, students in the ICES program will develop points of interest along the trail that will provide information about various plant and animal life. This project also is also important as it is ICES first partnership with the local community and lays the foundation to further develop those relations and partnerships. During the 2014-15 academic year, the Student Association, Inc. (SAI) and Interdisciplinary Center for Environmental Sciences (ICES) successfully applied for a grant with the Fruit Tree Planting Foundation (FTPF). Forty fruit trees were awarded including a mixture of apple, peach and pear. The orchard will serve as an outdoor edible orchard providing academic and community benefits. Students will be an important part starting with day of planting and pruning workshop and indefinitely going forward through various science classes. The community will benefit through the addition as the orchard may serve as a picnicking grove. 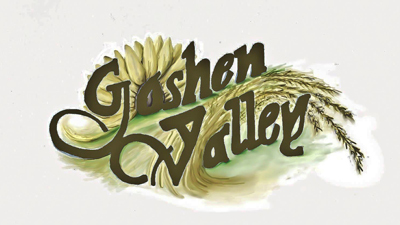 In addition the fruits may be donated to numerous local food pantries. The orchard will serve as an invaluable resource improving the surrounding environment and providing a source of healthy nutrition. This well field was first established as a joint investment by SAI, CalU Geology Club, the Pittsburgh Geological Society, and the Dominion Foundation. The well field includes multiple wells completed in the sedimentary bedrock at depths greater than 30 feet, as well as shallower wells completed to the top of bedrock, ranging from 13 to 18 feet. Each well is drilled during the annual Student Field Workshop, sponsored by the Pittsburgh Geological Society. At the workshop, Geologists and drillers come to the SAI Farm to work side-by-side with students. Over the course of the day, they show the drilling process using multiple techniques and rigs, take rock core samples, teach well construction and development, and demonstrate environmental testing and sampling techniques. In addition, students are given critical information regarding job site health and safety regulations and etiquette. This event provides an opportunity for students to learn, but also to meet, ask questions of, and network with potential employers in their chosen field. In addition to the Student Field Workshop, the wells are used for a variety of educational and research programs throughout the year. Geology classes, such as Hydrology, visit the site to take water depth measurements, collect water chemistry samples, and conduct aquifer tests. Students use the wells for research to understand the communication between the local surface water systems in the Pike Run Watershed and the shallow groundwater of the upland slopes. Data gathered from these wells is used in constructing a continuously updated groundwater model for the SAI Farm property. The academic benefits are plentiful, but the greatest contribution the well field offers is an opportunity for students to conduct geological testing and analysis under real-world circumstances and challenges, better preparing them for their future careers in Geology and Environmental Sciences.